Matthew Broderick, aka Ferris Bueller, might not be too happy to know the house in the movie that made him famous it at risk. Just like the titular devil-may-care teenager, the house made famous in the ‘80s comedy "Ferris Bueller's Day Off" is a one-of-a-kind. But it's also an endagered species. The glass-enclosed Highland Park homes has been included on the “Ten Most Endangered Historic Places in Illinois,” a list by non-profit Landmarks Illinois, reported Tribune Media Co. Each of the historic homes on the list -- which includes a group of homes in Naperville, the original Libertyville High School and a three Frank Lloyd Wright homes -- is in danger of being torn down. The list was unveiled at the State Capitol in Springfield this morning. Remember Bueller sidekick Cameron Frye? This glass and steel home is known for its prime role in the infamous car scene from the classic John Hughes film, Ferris Bueller's Day Off. You know the one where Cameron crashes his dad's Ferrari into the garage in the ultimate act of rebellion? Cantilevered over a Chicago ravine, this contemporary home features sleek minimalist details and architecture that pair well with its serene surroundings. 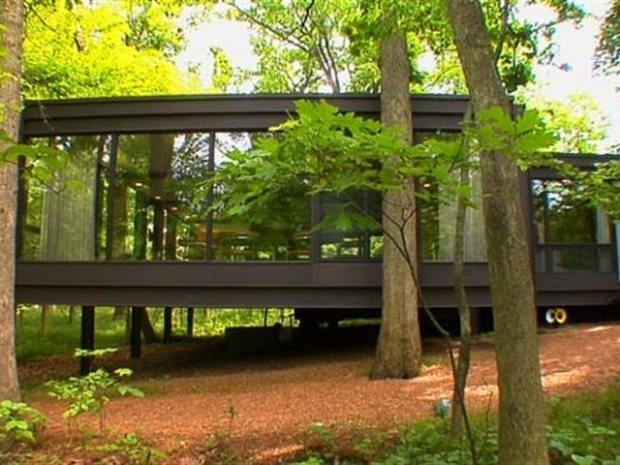 The "Ferris Bueller house is located in Highland Park and was designed by architect A. James Speyer. It was built between 1952 and 1954 and is currently on sale for $2.3 million. The man who made it famous, John Hughes, died last month.